Anaplasmosis is a disease caused by a rickettsial parasite of ruminants, Anaplasma spp. The microorganisms are Gram-negative, and infect red blood cells. They are transmitted by natural means through a number of haematophagous species of ticks. The Ixodes tick that commonly transmits Lyme disease also spreads anaplasmosis. Anaplasmosis can also be transmitted by the use of surgical, dehorning, castration, and tattoo instruments and hypodermic needles that are not disinfected between uses. In cell biology, an endosome is a membrane-bound compartment inside eukaryotic cells. It is a compartment of the endocytic membrane transport pathway originating from the trans Golgi membrane. Molecules or ligands internalized from the plasma membrane can follow this pathway all the way to lysosomes for degradation, or they can be recycled back to the plasma membrane. Molecules are also transported to endosomes from the trans-Golgi network and either continue to lysosomes or recycle back to the Golgi. Endosomes can be classified as early, sorting, or late depending on their stage post internalization. Endosomes represent a major sorting compartment of the endomembrane system in cells. In HeLa cells, endosomes are approximately 500 nm in diameter when fully mature. Thrombocytopenia is a condition characterized by abnormally low levels of thrombocytes, also known as platelets, in the blood. Leukopenia is a decrease in the number of white blood cells (leukocytes) found in the blood, which places individuals at increased risk of infection. Lyme disease, also known as Lyme borreliosis, is an infectious disease caused by a bacterium named Borrelia spread by ticks. The most common sign of infection is an expanding area of redness on the skin, known as erythema migrans, that appears at the site of the tick bite about a week after it occurred. The rash is typically neither itchy nor painful. Approximately 70–80% of infected people develop a rash. Other early symptoms may include fever, headache and tiredness. If untreated, symptoms may include loss of the ability to move one or both sides of the face, joint pains, severe headaches with neck stiffness, or heart palpitations, among others. Months to years later, repeated episodes of joint pain and swelling may occur. Occasionally, people develop shooting pains or tingling in their arms and legs. Despite appropriate treatment, about 10 to 20% of people develop joint pains, memory problems, and tiredness for at least six months. Neutrophils are the most abundant type of granulocytes and the most abundant type of white blood cells in most mammals. They form an essential part of the innate immune system. Their functions vary in different animals. Selectin P ligand, also known as SELPLG or CD162, is a human gene. Indirect immunofluorescence assay is the principal test used to detect infection. The acute and convalescent phase serum samples can be evaluated to look for a four-fold change in antibody titer to A. phagocytophilum. Intracellular Inclusions (morulae) are visualized in granulocytes on Wright- or Giemsa- stained blood smears. Ehrlichiosis is a tickborne bacterial infection, caused by bacteria of the family Anaplasmataceae, genera Ehrlichia and Anaplasma. These obligate intracellular bacteria infect and kill white blood cells. Anaplasma is a genus of bacteria of the alphaproteobacterial Order Rickettsiales, Family Anaplasmataceae. Ixodes scapularis is commonly known as the deer tick or black-legged tick, and in some parts of the US as the bear tick. It is a hard-bodied tick of the eastern and northern Midwestern United States and southeastern Canada. 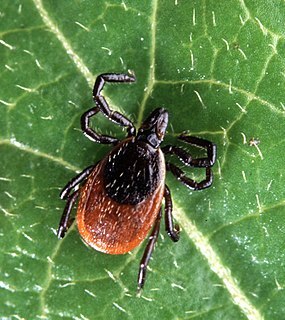 It is a vector for several diseases of animals, including humans and is known as the deer tick owing to its habit of parasitizing the white-tailed deer. It is also known to parasitize mice, lizards, migratory birds, etc. especially while the tick is in the larval or nymphal stage. Ehrlichia ewingii is a species of rickettsiales bacteria. It has recently been associated with human infection, and can be detected via PCR serological testing. The name Ehrlichia ewingii was proposed in 1992. ↑ Dumler JS, Barbet AF, Bekker CP, et al. (2001). "Reorganization of genera in the families Rickettsiaceae and Anaplasmataceae in the order Rickettsiales: unification of some species of Ehrlichia with Anaplasma, Cowdria with Ehrlichia and Ehrlichia with Neorickettsia, descriptions of six new species combinations and designation of Ehrlichia equi and 'HGE agent' as subjective synonyms of Ehrlichia phagocytophila". Int. J. Syst. Evol. Microbiol. 51 (Pt 6): 2145–65. doi:10.1099/00207713-51-6-2145. PMID 11760958. 1 2 3 Tick-Borne Fever reviewed and published by WikiVet, accessed 12 October 2011. 1 2 3 4 5 Dumler JS, Choi KS, Garcia-Garcia JC, et al. (December 2005). "Human granulocytic anaplasmosis and Anaplasma phagocytophilum". Emerging Infect. Dis. 11 (12): 1828–34. doi:10.3201/eid1112.050898. PMC 3367650 . PMID 16485466. ↑ Thomas V, Fikrig E (July 2007). "Anaplasma phagocytophilum specifically induces tyrosine phosphorylation of ROCK1 during infection". Cell. Microbiol. 9 (7): 1730–7. doi:10.1111/j.1462-5822.2007.00908.x. PMID 17346310. 1 2 "Human Anaplasmosis Information for Health Professionals: Diagnostic tests". Diseases. Minnesota Department of Health. Zhang L, Liu Y, Ni D, et al. (November 2008). "Nosocomial transmission of human granulocytic anaplasmosis in China". JAMA. 300 (19): 2263–70. doi:10.1001/jama.2008.626. PMID 19017912.